Battalion Wars 2 is a game for the Wii, a sequel to the GameCube game, Battalion Wars. It was officially announced August 23, 2006 at the Leipzig Games Convention with the official title, as well as the stylized abbreviation BWii. The game was developed by Kuju Entertainment, which also developed the GameCube predecessor, and was published by Nintendo. 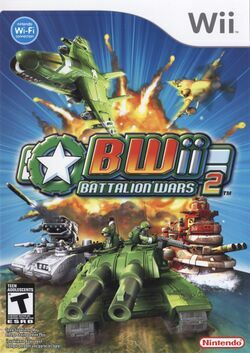 Nintendo released Battalion Wars 2 on October 29, 2007 in North America and on December 6, 2007. The game was released on February 15, 2008 in Europe. Centuries ago a dark shadow cast over the globe. The Iron Legion had all but crushed the free nations of the world. The Iron Legion is preparing for the final onslaught of the lightning wars. But one nation dared to oppose them the Solar Empire. They fought many battles but the Iron Legion almost won all of them but the Staff of Qa Len destroyed the Iron Legion. Centuries later a plot is ready to set the free nations of the world at WAR! This page was last edited on 21 February 2018, at 18:16.